Denim Jacket - East London Style (Home-made), Onsie - H&M. But then one day when Lyric and I were in Paris, foraging around the flea market. I had an idea. Why not attach them to something, 'a something' which would put them all together in one place. At the same time, patches were massively popular. It occurred to me that both patches and badges would be best placed on denim. Lyric and I found a child old denim jacket. 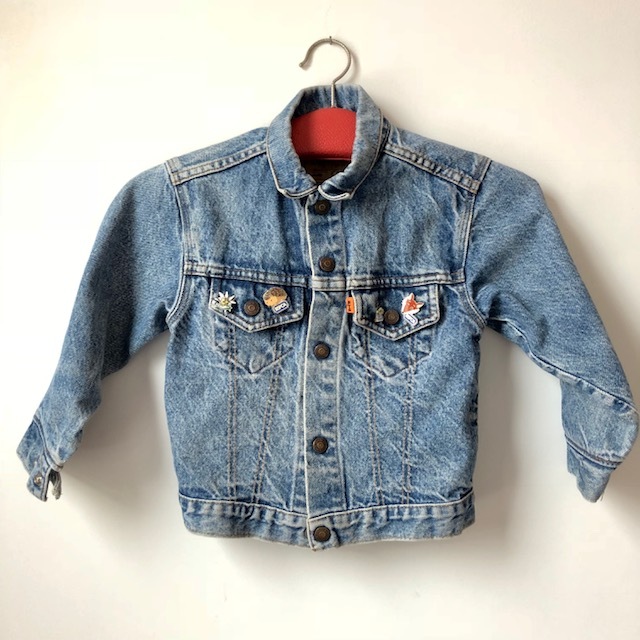 Simply we washed it and from then on any badges we were given or found we put onto the denim jacket. Such a simple thing and when he finally grows out of it, I have every intention of framing it. The jacket brings me immense pleasure and fond memories - all in one place. Please note, it doesn't have to be a denim jacket. Any item of clothing would work but a jacket works well as the pins aren't in direct contact with the skin.